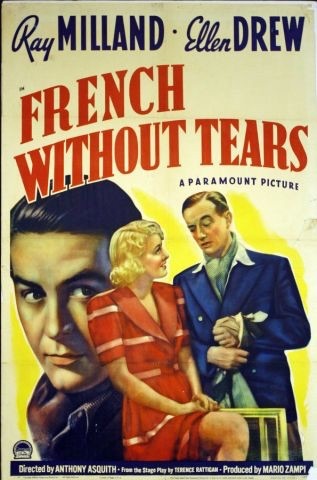 A Paramount British production, FRENCH WITHOUT TEARS is based on the Terence Rattigan play and is set in Prof.Maingot’s French School for English Gentlemen. Most of the students are learning French in order to become diplomats. Ray Milland is Alan who is attracted to Diana (Ellen Drew) who is visiting her brother Kenneth (Kenneth Morgan). Diana is a terrible flirt and Brian (Guy Middleton) and Bill (Roland Culver) also fall for Diana. They all seems to spend more time having fun than studying.It’s a gentle comedy and I was very impressed by Milland and Drew. The film’s credentials are good – direction by Anthony Asquith and editing by David Lean. The 86 minute comedy was reduced to 66 minutes on its American release . The original 1936 London play had quite a cast – Rex Harrison, Trevor Howard and Jessica Tandy. Yet another film I’d love to see restored and issued on DVD.